Co-published by Routledge for the American Educational Research Association (AERA)Educational policy continues to be of major concern. Policy debates about economic growth and national competitiveness, for example, commonly focus on the importance of human capital and a highly educated workforce. 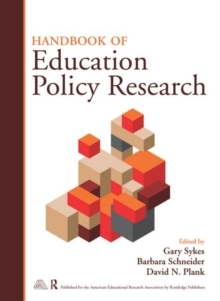 Defining the theoretical boundaries and methodological approaches of education policy research are the two primary themes of this comprehensive, AERA-sponsored Handbook. Organized into seven sections, the Handbook focuses on (1) disciplinary foundations of educational policy, (2) methodological perspectives, (3) the policy process, (4) resources, management, and organization, (5) teaching and learning policy, (6) actors and institutions, and (7) education access and differentiation. Drawing from multiple disciplines, the Handbook's over one hundred authors address three central questions: What policy issues and questions have oriented current policy research? What research strategies and methods have proven most fruitful? And what issues, questions, and methods will drive future policy research? Topics such as early childhood education, school choice, access to higher education, teacher accountability, and testing and measurement cut across the 63 chapters in the volume. The politics surrounding these and other issues are objectively analyzed by authors and commentators. Each of the seven sections concludes with two commentaries by leading scholars in the field. The first considers the current state of policy design, and the second addresses the current state of policy research. This book is appropriate for scholars and graduate students working in the field of education policy and for the growing number of academic, government, and think-tank researchers engaged in policy research. For more information on the American Educational Research Association, please visit: http://www.aera.net/.